I know first hand that back to school mornings can be a little hectic, especially if you have more than one child in school! 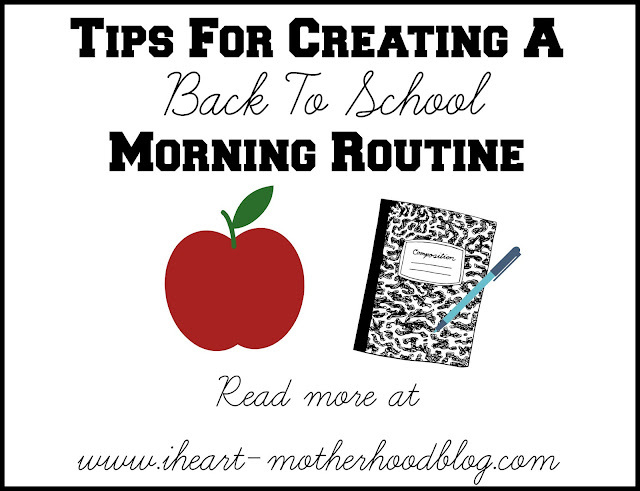 So today I wanted to share a few tips that have made our school mornings a little easier and I hope they will help yours as well! Set out everyone's clothes the night before (including your own). Go to bed with a clean kitchen. This one is a big one for me, this is where we spend most of our time & there is just something about waking up to a clean kitchen that gets your day started off just right! If your kids take their lunches to school, pack their lunch box the night before & place it on a shelf in the fridge. Get a good night's rest every night. If possible, get up a few minutes before your kids do. This will give you a few minutes to get ready and enjoy some quiet alone time. Even if it's 15 minutes or 30 minutes, try it just during the weekdays. Check everyone's backpacks the night before, go over any homework, sign papers/notes, empty folders, etc. Set everyone's backpacks or bags by the door. That way they are not forgotten & everyone's is all together in the same place. Have your kids pick them up on the way out to the car! Have everyone bathe or shower the night before, one less thing to try to fit in your morning! (I even shower at night, I just don't have time in the morning anymore). Every night before bedtime go over everyone's schedule for the next day (or you can do it during breakfast the day of). Review errands, after school activities, therapy, etc for the upcoming day. Create a snack drawer or bin for the fridge & pantry. Keep snacks handy like a variety of fruit, cheese sticks, yogurt tubes, pretzels, granola, etc. Easy grab & go items are perfect if your kids need to eat on the run or just need an after school pick me up! I love to plan ahead, it just helps keep me organized & everything seems to run a little bit smoother when we have a good routine going. What are your school mornings like? Any tips to share?